The number of trips up and down depends on the weight, with max. load (130 kg) = 6 cycles, with 85kg's = 10 cycles. Available in white (460900252), blue (460900312) or grey (460900432). 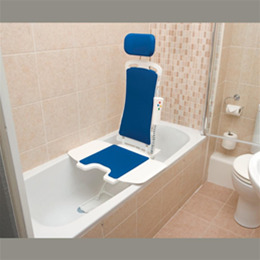 Built in safety controls.4 quick release suction cups with option for an additional 2 for anti-slip bath base. Excluded from the guarantee are wear parts as covers and suction cups.